The penguins as seen from an aerial drone. 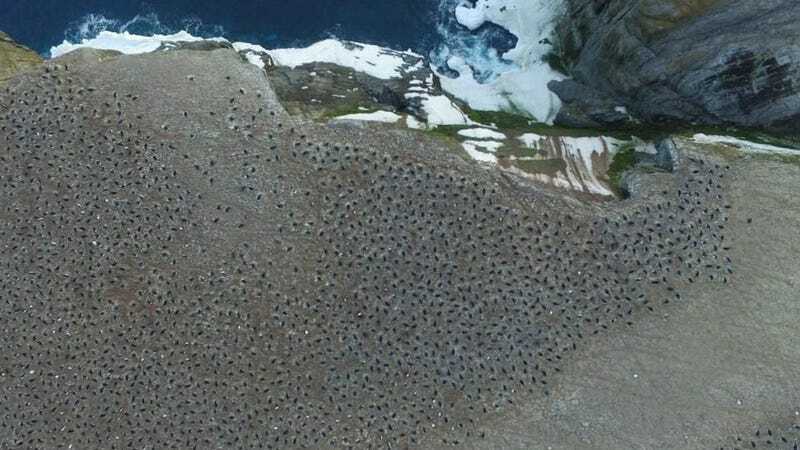 After noticing the telltale signs of guano streaks on satellite imagery, an international team of researchers set out to count the number of penguins on Antarctica’s aptly named Danger Islands. They found a previously undetected supercolony of over 1.5 million Adélie penguins—a surprising result, given how poorly these aquatic birds are doing just 100 miles away. Adélie penguins are hurting along the western side of the Antarctic Peninsula; their numbers have been in decline for the past four decades. These penguins are also known to exist in the northern regions of the peninsula, but this area is hard to explore, and scientists figured that penguin populations were suffering there as well. New research published in Scientific Reports shows this assumption was incorrect. A census of Adélie penguins along the Danger Islands—a chain of remote, rocky islands at the northern tip of the peninsula—has yielded a seabird hotspot that’s home to some 1.5 million penguins. James Clark Ross, a 19th century British explorer, knew what he was doing when he gave the Danger Islands their name. The waters in and around this island chain are treacherous, featuring heavy fragments of ice even during the summer months. It’s a difficult place to access, and scientific expeditions to the region are understandably few. Four years ago, Heather Lynch, an ecologist at Stony Brook University and a co-principal investigator of the new study, teamed up with NASA colleague Mathew Schwaller to look at satellite photos of the region. The photos yielded huge streaks of guano stains, suggesting more penguins may live in the region than previously thought. This prompted a 2015 expedition to the island chain involving researchers from the Woods Hole Oceanographic Institute, Oxford University, Louisiana State University, and other institutions. Penguins romping about on a slab of ice in the Danger Islands. Soon after their arrival, the team realized that counting the number of penguins by hand was going to be impossible. To complete this monumental task, the scientists used a modified commercial quadcopter drone to get a bird’s eye view of the flightless aquatic avians. These photos were stitched together into a massive mosaic, showing the Brash, Earle, Beagle, and Heroína Islands in both two and three dimensions. Once back at the lab, the researchers used an AI in the form of a Deep Neural Network (DetectNet) to analyze the collage, searching for—and meticulously counting—individual penguin nests. In total, they found that the Danger Island chain is home to a whopping 751,527 pairs of Adélie penguins. So at bare minimum, this region is home to 1,503,054 penguins—not including unpaired penguins and any chicks that may be scurrying around. Drones were used to assist in the penguin census. This result prompted yet another review of pre-existing satellite imagery, which showed that this supercolony has actually been around for a while—at least since 1959. “Scientifically, while this is a huge number of ‘new’ penguins, they are only new to science,” said study co-author Tom Hart, a researcher at Oxford’s Department of Zoology, in a statement. This is an odd result given what’s happening on the western side of the Peninsula, which is just 100 miles (180 km) away. “Not only do the Danger Islands hold the largest population of Adélie penguins on the Antarctic Peninsula, they also appear to have not suffered the population declines found along the western side of Antarctic Peninsula that are associated with recent climate change,” Mike Polito, a Louisiana State University ecologist and co-author of the new study, said in a statement. The discovery of the supercolony raises some important questions. Why are the penguins doing so well at the northern tip when their counterparts on the west side are struggling so badly? Is it climate change related, as suggested by Polito? Perhaps the differences in population has something to do with extended sea ice conditions on the north side, or the availability of food. “That’s something we don’t know,” admitted WHOI seabird ecologist Stephanie Jenouvrier. One thing this discovery is making clear, however, is the need to protect regions around the Antarctic Peninsula. The western side is often perturbed by human activity, and these new observations suggest penguins fare better when they’re undisturbed. This latest find could add support for the proposed Marine Protected Areas designation for the Weddell Sea.